Yeah finally am an owner of an Eaziscore board so I thought I would try a Gate fold card. Had in my head I wanted baby booties on a washing line as I'd had some mini pegs for ages and didn't know what to do with them. 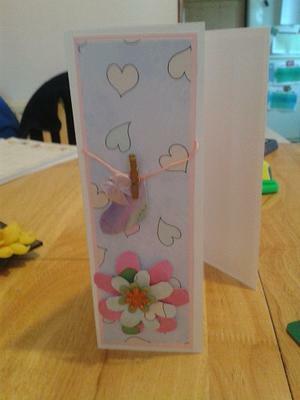 The paper was Sweetie Pie kit from Making Handmade Cards. Inside I used the 3 circle pram tutorial which I'm really pleased with. It was so easy and again used the same papers. The flowers were made from the same papers but they definitely need more practice. 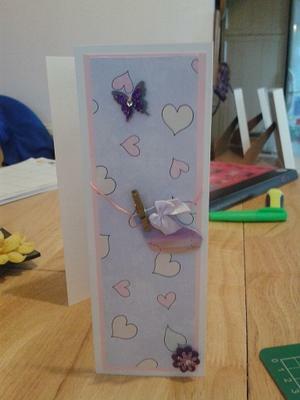 The other side of the card with the 2 little purple flowers seems a bit bare to me, but I'm not sure what to do without making it just too much, so I'm going to leave it. Anyhow I had lots of fun making it, I just hope the parents like it. I am sure that the parents will love it and you have made it so pretty. Baby cards are one of my favorite things to make ... especially baby girl ones.... as out come the Flowers, Ribbons and Pearls. 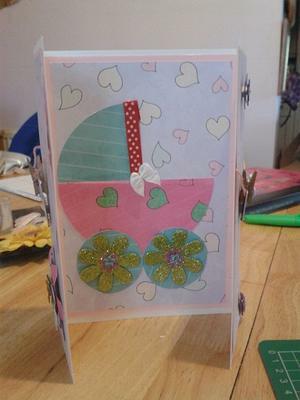 If you want to make the Baby Pram as Mandy has done then you will find the tutorial in the Easy Projects in the NavBar to your left. Hi Mandy. What a sweet card you made. I'm sure everyone will love it! Well Done.